All transactions are safe and secure with a reliable history in online purchasing behind each of our associates. 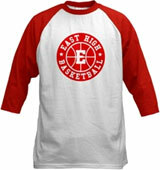 Buy the East High Basketball t-shirts to own High School Musical clothing and merchandise. The fronts of these High School Musical tees feature an East High Basketball logo. Wear this piece of HSM apparel as you cheer on Troy Bolton (Zac Efron), Chad Danforth (Corbin Bleu), Zeke Baylor (Chris Warren, Jr.), and Jason Cross (Ryne Sanborn) to another East High Wildcats victory. This design is also available on short sleeves, tank tops, and High School Musical sweatshirts. In addition to the East High Basketball tees above, browse the High School Musical Clothing Gallery for more apparel like men's and women's clothes, kids shirts or hoodies.